This is a wine with a long name. People with attention deficit disorder may lose interest in it before they finish reading the label. But it's well worth investigating. Rosenblum Cellars does some pretty wonderful things with the Zinfandel grape. It's no surprise that winemaker Kent Rosenblum is known to many as "The King of Zin." This blend of Zinfandels hails from 15 different California growing regions and over 80 different vineyards (!) from Sonoma to Napa to Lodi to Lake County to Paso Robles, wherever the four winds blow. Its time in oak was split: 40% French oak barrels, 60% American wood. It's a very dark wine, a purple ink color I can barely see through. On the nose, the fruit comes first. Blackberry and raspberry figure huge in the aroma scheme, and then a vanilla note comes through, with a peppery trace around it. The palate shows extreme fruitiness, with a really nice cherry cola effect. The medium body sits comfortably on my tongue and a good acidity means "food friendly," as if there were any doubt about it. The finish lingers nicely. The tannins are firm - it's a dry wine - but, surprisingly, the wine is quite smooth considering the elevated alcohol level. The smoothness increased noticeably after the wine had been in the glass for about twenty minutes. Rosenblum's Zinfandel Vintner's Cuvee XXXI is a great $12 wine. So much the better that I picked it up for $9 at Wally's tent sale. Denise and I recently had lunch with our friend Guido at Sprazzo on Westwood Boulevard. Well, that was the plan, anyway. The wires got a little crossed, and when Guido didn't show in his usual timely manner, we started without him. Guido arrived about the time we were getting up to leave, so we hung around and watched him eat a Caesar salad. It worked out fine for me - I got to have lunch with my wife, visit with our pal, and have one of my favorite Italian grapes. Vermentino is a specialty of the island of Sardegna, and Santadi is a winemaker's co-op there. 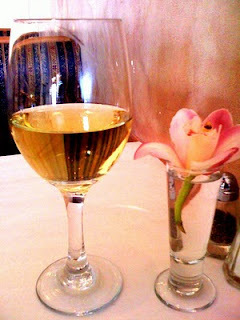 The wine is a beautiful golden color with a greenish tint. It looks wonderful in the glass. It smells great, too. There's a floral scent that is laced with an overriding minerality, sort of like flowers that have been trod into some wet rocks. Pears and melons are on the palate, but again it's the minerals you really notice. The taste is almost salty or briny. Perhaps that's only to be expected from grapes grown in Sardinia. Their seafood staples are a natural match for this wine. I had it with a salmon salad but would imagine it's even better with marinated calimari or scungilli. If you've never tried a Vermentino with seafood, you really should do yourself a favor. You'll be pleased. I love day tripping to the Temecula Valley for some wine tasting. It's not too far from Los Angeles, the countryside is beautiful, the wine trails are really simple, the wines are often award-winning, and the quality is always high. If you've never been to Southern California's wine country, early March brings about a great way to get an introduction. The Temecula Valley Winegrowers Association has a world of wine to offer over their Barrel Tasting Weekend, March 6th and 7th. Their two-dozen-plus member wineries will swing open their cellar doors and invite you in to sample tank and barrel tastings of future vintages along with tastings of finished wine. The event is even catered. Each winery will have food selections specially paired with featured wines. You can start almost immediately after exiting the 15 Freeway. Take Rancho California Road or the De Portola Trail to get started on your self-guided tour. At your first stop you'll get a winery map with menu listings, a passport ticket and a souvenir logo glass. Take a few minutes to map out the wineries you want to visit - if you haven't already done so - and get started. You may be surprised that you'll find some new favorite wines as a result of your visit. I know I was. I found several new favorites at Hart Winery on my first visit. Also try to make it by South Coast Winery Resort and Spa. It is the jewel of the valley. It was the first Southern California Winery ever to win the coveted Golden Bear Award at the California State Fair as “Best Winery in California.” They followed up that success by winning the award again. The World of Wine Barrel Tasting Weekend runs from 10:00 a.m. to 4:00 p.m. both Saturday and Sunday. Tickets are $89 per person. Sunday Only and Designated Driver tickets are available at a discount. I was all set to knock off the cheap wine bit for a while and give this series a rest. But as Denise and I strolled into Trader Joe's my eye was grabbed by a stack of unfamiliar wine bottles. I inspected the new material and found Cab, Petite Sirah, Zin and Sangiovese involved. My favorite suspects. A five dollar sticker meant that even if it turned out to be horrible, it would be no big loss. Perish the thought. Chariot Gypsy is a very nice wine. Yes, it's an everyday wine. That doesn't mean it can't be good every day. First, it pours up as a deep, inky purple. I can barely see through it. There's raspberry on the nose along with some bright cherry and a smokey element. The palate features tons of fruit - blackberries and blueberries - in a rather dark but accessible fruitiness that is right up front. Fruit bomb? Yes, thank you. But there's enough going on to make it an interesting explosion. The wine has a nice acidity, but it's not overdone. Firm tannins provide plenty of backbone for food pairing. It tasted great with chicken sausages with onions. Chariot Gypsy is available exclusively though Trader Joe's. Zinfandel is considered by most to be the "national wine grape of California." It was one of the first grapes planted by immigrant winemakers in the nineteenth century, and many Zinfandel vines from that era still exist today. 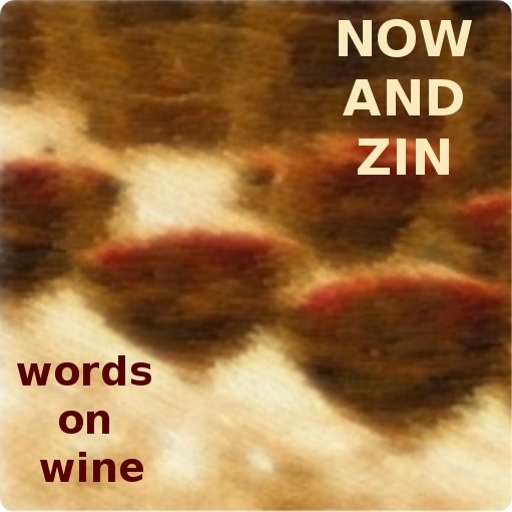 "Old vine Zin" is, in fact, a phrase that is nothing short of beloved in certain wine circles. How fitting to have a celebration of that grape in one of the places where it grows best, Paso Robles. The weekend of March 19 - 21 will offer Zin lovers the opportunity to wallow in it - an entire weekend devoted to the Zinfandel grape and the astounding wines that are produced from it. The Zin Tasting on Saturday will feature the Zinfandel and Zin blend wines of over 50 wineries from the Paso Robles area, along with cuisine from some of the area's finest restaurants. The Wine Country Auction, according to the website, supports " the vineyard worker population who play a major role in bringing the spirit of Zinfandel alive. A portion of the funds raised will be donated to health, education and greater community programs for the local vineyard workers and their families." There are also scores of events at individual wineries in the Paso Robles area, giving you ample opportunity to discover the treasures of the AVA. One of the highlights of the annual event is the release of the Collaborative Zinfandel Blend. Each year a Zinfandel Festival Blend Master is selected, and it is that person's responsibility to create a Zinfandel Blend from the finest Zins available in Paso. The 2010 Blend Master is Mike Giubbini of Rotta Winery. His special blend will be available for purchase at the Wine Country Auction, as will verticals from previous years. Tickets to the Zin Tasting and Wine Country Auction are priced at $60 and $85. Individual winery events are separate. The Central Coast AVA of Paso Robles offers warm days, cool nights and lots of hang time, elements crucial to the proper cultivation of Zinfandel. There's plenty of exploring to be done over the course of this event, with over 180 wineries in the AVA from which to choose, so be sure to plan some time to visit a few great Paso Robles wineries. "A classic Rhone bottle with a lovely piece of artwork by Jacob DeBacker, done in 1591. The two cherubs in the piece are said to represent the two sides of wine - happily inebriated and sadly remorseful. I'd like to think that I rarely go to either of those extremes. I'll take the art as a word of warning, however, and try to stay in the middle ground. Very little else about the wine is learned on the label, save for an ABV number of 14.1%. To the internet I go, to find the makeup of this wine. 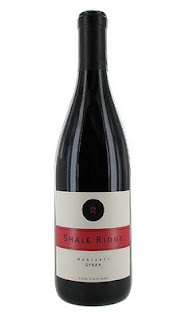 It is a Rhone blend of 52% Syrah, 22% Grenache, 20% Mourvedre and 6% Petite Sirah. $25. "The aromas are rich, if not pungent. Much dark fruit and a spicy, leathery component make for a complicated smell. I get blueberry, plum, some pepper and licorice. It's dark, but invitingly so. "It drinks a bit on the hot side if you rush it. Better let this wine calm down quite a bit before imbibing, or the tannins will have their way with your palate. Once you're past that, it's a brooding drink. Sit the glass on the table and walk around the room a bit. Watch television for a spell. Then turn it off and go back to the glass, perhaps sneaking up from a different angle. Take your time, and the joy will begin. This is a good wine, a very good one. But it's not something to bring to a party. I drank it without food, and enjoyed it. I do think it would go very nicely with a charcoal-grilled steak, even a hamburger right off the grill. Beef Stroganoff, perhaps. But the food just might shift the focus away from a wine that clearly wants every bit of your attention. And deserves it." I usually write tasting notes here about wines I drink at home. I like giving a wine several different opportunities to show off its good qualities. Tasting a wine at home over a three-day span gives me a chance to experience the wine in different settings and different points in its evolution once the bottle is open. But I do like to have wine when Denise and I go out for dinner. My note taking is not as detailed in those situations, and I'm only getting one little snapshot of what the wine is like. Every now and then, though, I run into a "restaurant wine" that really strikes my fancy. Alamos Malbec is on the list at Wood Ranch Barbecue and several other restaurants we frequent. I usually like to try something different when I'm out, but I have found myself going back to this Malbec over and over. It's a dark purple color and has a very rich nose, full of fruit and some herbal traces. There's leather, too. The palate is a real treat, full of ripe fruit, dark berries, cherries, maybe some plums. This is a very smooth and drinkable wine with almost no tannic edge, and it paired extremely well with a barbecued chicken salad full of tomatoes. As if all that isn't enough, there's a lengthy and satisfying finish. The Alamos Malbec is hard to beat, particularly at the price. It runs about $8 a bottle, and I usually pay about $7 or $8 for a glass of it in a restaurant. The wines on the list that cost nearly twice that should feel a little bit of competition. We definitely did not drink enough sparkling wine in my household over the holidays, as here I am dragging another bottle out and blowing off the dust for another weekend bubblefest. Come to think of it, this is a pretty good way to celebrate Saturday. At this rate, we may not have enough left to celebrate Texas Independence Day! Rotari Brut is a sparkling wine hailing from the Adige Valley in Italy's Talento region. It's Italian, but it's not Prosecco. This festive wine is produced in the Metodo Classico, meaning it's fermented a second time in the bottle. Rather clean and fruity on the nose, this pale yellow sparkler is dry and crisp, with pears and citrus notes on the palate. A strong streak on minerals is also present. 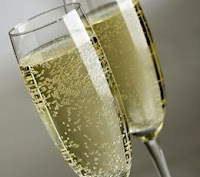 It does not have the extremely yeasty aroma or taste that Methode Champenoise wines often have. Of course, you may not count that in the "plus" column. I rather like a bit of funk on my sparkling wine. Winemaker: Rotari Talento Trento D.O.C. I saw Il Ducale (a more recent vintage) on sale at Ralph's recently, and it made me think of a bottle of their 2004 I had at least a year ago, maybe longer. I had notes on it, so I'm presenting them here. "Classy looking maroon and wheat label with a picture of an etching. It looks to be a nobleman being served a glass of wine by a young fellow dressed a lot like Robin Hood. There is a woman waiting, off to the side, and some horses on the other side. A hilltop peaks in the background and forms a pyramid directly over the nobleman's glass of wine. Or maybe it was water. Who really knows? "There's a lot at play on this whiff. Seems like blackberries, cherries and what my wife calls a "grape jelly" aroma predominate. She means the liquid grape jelly, before it is made into jelly. We also smell Band Aids and a little petrol, or creosote. Something like that. Very interesting smell. "I love Sangiovese, and Ruffino does it so well. This is no exception. The fruit is bold, but not overpowering. The wine feels good in the mouth, but not too heavy. Nice finish that leaves me wanting more. I had the wine with a blue cheese. It tasted great, although the cheese was probably a bit too much for the wine. This bottle came from my local supermarket, Ralph's, who had it on sale for about $16. It's usually a $22 bottle. It always tastes better when you got a good deal, doesn't it?" If you think very much at all about the wine you drink, you no doubt make a lot of comparisons in your senses. "Has a greenish hue" or "smells like violets" or "tastes like wet rocks" probably come to mind occasionally. 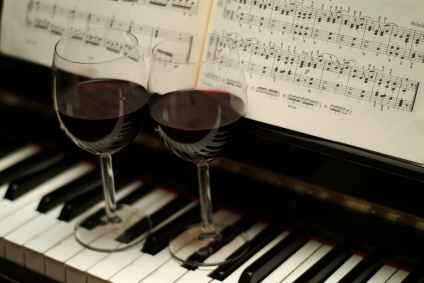 I love music, and I started thinking about what musical instruments I would match with the wines I taste. A light and berry-flavored rosé might be well suited to the dancing notes of the piccolo. Champagne - and all the other sparklers - would have to be a glissando on the harp. The full, rich notes of the cello is a natural for a creamy, buttery Chardonnay, while its stainless steel brethren says "violin" to me. Sauvignon Blanc seems like a clarinet, the way Pete Fountain played it. I like the oboe for a rich and complex Pinot Noir, while Torrontes tastes like a flute to me - preferably the one heard in "The Girl From Ipanema." The trumpet would be a perfect match for a big, brassy Zinfandel. The refined French horn could represent a smokey and lush Merlot. Big, bold sounds would have to signify big, bold Cabernet Sauvignon, so I'd match Cabs with the tympani and the bassoon together. Port strikes me as a tuba kind of wine, while the many facets of Rhone blends would glide easily from one to another on the slide of a trombone. The next time you're tasting a wine you like, think about what sounds the wine conjures up, and make your own kind of music. Please feel free to comment here with any discoveries or revelations that surface. Now, I think I'll open a nice Sonoma County trumpet. If you're going to try and bust a recession, you might as well bring out the big guns. A $4 bottle of wine would be a huge gun in a war on recessionary wine prices - if it's good. This label belongs to Lockwood Vineyard in San Lucas, in Monterey County. The name comes from the shale found in their soil, no doubt. The grapes are all estate grown, as is Lockwood's custom. I'm swirling right now. Let's taste. The wine sits in the glass a fairly deep shade of red, but it is not opaque. There is quite a bit of heat on the nose, but also quite a bit of blackberry and currant. Pepper arises on the palate, and the spice seems a bit much until after a half hour or so when the tannins have settled. The dark fruit tastes good in the mouth and lingers a bit on the finish. I didn't really expect a revelatory experience for $4, and I wouldn't say I had one while drinking this wine. I did, however, find it to be very flavorful and aromatic, with a complexity that grew as time passed. After an hour or so in the glass, I was actually quite pleased with it. I did not try it with food, but something tells me it would pair well with a pork chop or a hamburger. Explain the meaning of the title of this piece? Wine festivals are so much fun all on their own. But it's great when the tasting and sampling is done for a good cause. The 17th edition of the Casa Pacifica Angels Wine and Food Festival is coming up Sunday June 6, 2010 from 1:00 to 5:00 p.m. This charitable wine and food event was voted the number one cultural event in Ventura County for two years running. The wine of California and the cuisine of an area stretching from Santa Barbara to the Conejo Valley will be spotlighted. Over 100 wineries and breweries will be on hand, as will a host of restaurants, caterers and bakeries. June 6, 2010 1:00 - 5:00 p.m. Cost: Tickets are available online @ $75 each until April 15th, $90 until June 5th and $100 at the door. VIP tickets are available for $200 each and include perks like valet parking and a special lounge. Proceeds from the festival benefit Casa Pacifica, the Camarillo-based crisis-care and residential treatment center for children. Casa Pacifica has been serving their community since 1994, and some 430 children and their families are helped every day by this organization's programs. Please visit Casa Pacifica to find out more about them and the good work they do. 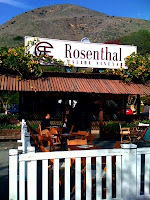 I made a Saturday jaunt recently to the Rosenthal Estate Wines tasting room, on PCH in Malibu. It was one of those sunny, 75 degree winter days Southern California is known for. It was a perfect day for a trip into Malibu's 26 miles of beachfront property. The tasting room seems casual enough, with seating outside and a small bar indoors. The room has a rustic and funky appearance that I really like in a tasting room. I remember tasting Rosenthal wines as well as their Surfrider line. That's about all I can tell you, as the notes I took never made it out of my pocket. They did make it into the washing machine, where they were rendered unrecognizable as paper. I am able to tell you that I liked everything I tasted that day, and that a bottle of the Surfrider Chardonnay came home with me. It's a pale straw-colored wine. The nose features a fragrant show of mainly tropical fruit and flowers. The palate is not belabored by wood, although it is 30% barrel-fermented, with five months in oak. In fact, it feels quite clean and crisp in the mouth. The fruit comes from Edna Valley, not Rosenthal's Malibu estate, which may explain some of the minerality. I even noticed a slight effervecsence on the second day which I didn't see in the previous night's glass. I'm a big fan of Chardonnay with a hint of oak, but I also love a refreshingly unoaked variety. Surfrider falls somewhere in between. I'm glad I could hang five - fingers, that is - on a Surfrider Chardonnay. The Surfrider wines support the Surfrider Foundation, a non-profit environmental outfit concerned with preserving our oceans and the beaches upon which they lap. A donation is made for each bottle sold. Professional surfer Strider Wasilewski is featured - in a wave-leaping action shot - on the label, if that makes a difference to you. I was awaiting Denise's arrival at Sushi Dan the other night, and as I perused the wine list an old friend popped up - Cycles Gladiator Syrah. Denise had discovered this one for us at one of Wally's Tent Sales a while back. I liked it then, and I hoped I'd like it this time, too. I suspect it is the 2008 vintage they are serving at the restaurant, but I failed to check on that. This wine from the Hahn Estate of Soledad, CA, takes its name from an old French bicycle company. The whole crew is apparently bicycle-crazy. The wine sits ruby-red in the glass and smells of dark fruit and pepper. Blackberry and cassis greet the palate with notes of chocolate and a little white pepper. It's pretty smooth, but it has a nice acidity. The finish is a little off - a slightly medicinal edge crept in faintly. The fruit rocks while it's in the mouth, though. It's a very tasty wine for the price. A recent - and rare - excursion into late night dining took us to Greenblatt's Deli on Sunset. It was so late I did no dining at all. 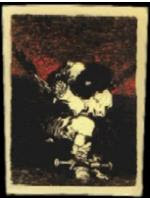 But while Denise enjoyed a turkey sandwich, I enjoyed a glass of Orin Swift "The Prisoner." It was about $12.50 a glass, which isn't bad considering it's a $35 bottle. Half Zinfandel, half five other grapes, this big blend packs a punch. The fruit is right up front. I don't know if the Zinfandel qualifies as ""old vine," but it tastes like it does. There's a huge pencil lead profile from the Cab, a lovely lushness and a bit of black pepper from the Syrah, darker features from the PS and complex shadings from the Charbono and Grenache. There were still a few bottles of holiday sparklers knocking around Wine Central, so I decided to pop one while watching Super Bowl XLIV. It figured that as one of those "Geaux Saints" fans, I'd probably end the game crying into my beer, so I thought a little cheering into my sparkler would be nice in case it got out of hand before The Who performed. This Gloria Ferrer Sonoma Brut is a 375ml bottle leftover from the holiday stretch. I'm told if your holiday sparklers are still around in February, you're either very good at conserving or you're not drinking enough. Either way, this one makes me happy the cork is popped. A nose of rich, yeasty toast and malt greets me - a formidable nose. It's a nose that makes its presence known. Apple on the palate gets really creamy. The wine has a huge mouthfeel, almost a beery sort of feel. It is produced by methode Champenoise - "fermented in this bottle," as the label says. I don't have any snack food to eat with it, but it feels so full in my mouth it's sort of a meal in itself. A good meal. Now, if the Saints can come back and win the Super Bowl, it will be just cause to pop the cork on another sparkler! I can still see the shadow of Groundhog Day, which means in six more weeks, spring will come and bring with it porch-fests full of wonderfully crisp white wines and lip-smacking roses. That's the plan, anyway. In Los Angeles, it seldom works out that way. The real hot weather doesn't arrive until July, maybe August, and if the morning fog gets on a roll it may be too cool for short sleeves until then. At some point the weather will warm up enough to make the allure of a refrigerated wine out on the porch too hard to resist. I don't prefer wine that's refrigerated. 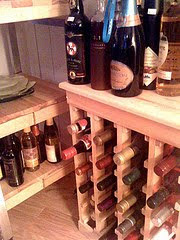 If the wine is too cold, its aromas and flavors are bound up in that icy liquid. But if it's hot enough outside, cold wine seems just fine. I like Sauvignon Blanc, a nice rose, a white Rhone blend on the porch, but as long as I'm daydreaming about spring's arrival, I'll daydream that I'm out there in my favorite Adirondack chair with Denise and a cold glass of Dr. L.
Dr. Ernst Loosen's Mosel Valley Riesling is a prime candidate for the porch. After pouring up a pale golden color, it shows an ever-so-slight effervescence. Those tiny, tiny bubbles may not be enough to get Don Ho going, but they look mighty refreshing to me. There's not as much mineral on the nose as I like in a white wine, but there is a trace of that slate soil in there. A whiff of pears also shows itself. On the palate, it's fruity but dry. There's a very refreshing sense to Dr. L, and nice, full feel in the mouth. You don't have to wait until warm weather to enjoy this Riesling, by the way. I drank it unchilled with a cold rain falling outside. Delightful. 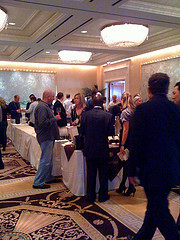 Ian Blackburn's wineshow company, Learn About Wine, produced another wonderful and well-attended tasting event at the Peninsula Hotel in Beverly Hills. On February 3rd, 2010 the spotlight fell on around 40 notable Santa Barbara County wine producers as Stars of Santa Barbara had its seventh annual affair. I have great fondness for wines from California's Central Coast, in particular from Santa Barbara County, so I anticipated this event like a kid does Christmas. I was not disappointed. The wineries represented hailed from the Santa Barbara area, from the city's Urban Wine Trail northward as far as the Foxen Canyon Wine Trail. If you have done much traveling on the backroads of the Santa Ynez Valley and the Santa Rita Hills, a number of the following names will be familiar. This is a short list of what I think are highlights of the event. Buttonwood presented a couple of wines I found to be curious. Their Cabernet Franc seemed positively bright, unusual in a variety which is noted for its darkness and density. The Syrah Rose shocked me. Blind, I would have sworn it was Sauvignon Blanc. That profile came through rather prominently in the taste, too. Winemaker Karen Steinwachs told me I wasn't the first person to tell her that. She offered an explanation that "the Syrah grows next to the Sauvignon Blanc." I wondered if maybe they had been harvested on a windy day. Coquelicot poured a blend called "Monamour" which has a pencil-point graphite aspect that's very appealing. I love their Sangiovese, wonderfully dense and dark with a very full mouthfeel. Fontes and Phillips offered a number of wines which, unfortunately, were kept a little too cold. This kept the aromas and tastes rather hidden, and was most problematic in the whites. The rose "Panky" was affected as well, and that was a shame. I know it to be an exceptionally good wine. Their Pinot Noir, "La Encantada," had lovely cherry notes. Foxen had a number of wines to pour, but I only tried the 7200 "Volpino," a Sangiovese/Merlot blend. It was spicy, bright and fruity, a complete joy. Jonata winemaker Matt Dees has crafted some wines that deserve attention. I tried these first at the tasting, but they were so good I wished I had saved them for last. A Cabernet Franc with stunning density, a Cabernet Sauvignon with the grace of a ballet dancer and the heft of a sumo wrestler, a luscious Syrah and Todos, a great kitchen-sink blend that brings the best of about 7 different grapes to the table and makes a feast of them. Lucas & Lewellen brought a Chenin Blanc with a great, nutty nose and a Petite Sirah that smelled almost like a chocolate bar. Qupe shared a table with AuBon Climat, so there was a fairly large crowd around them most of the time. I did get in close enough to sample the Marsanne/Roussanne blend, which opened with a citrusy tartness and finished smooth and almost creamy. The "Bien Nacido Hillside Estate" Roussanne smelled nutty and beautifully pungent. It, too, finished quite nicely. Tantara poured a Chardonnay with a full mouthfeel and a strong wood profile and a Piont Noir with a flinty nose. Proceeds of a silent auction benefitted the TJ Martell Foundation and Cancer Research at Children's Hospital Los Angeles.